After using the new RSPduo for a couple of months, I can say yet again that SDRPlay has produced another excellent product in their inexpensive line of wide range SDR products. After the original SDRplay RSP1 was introduced SRplay continued to enhance and improve the platform by releasing new models with improved and new features. However the new SDRPlay RSP units such as the RSP2, RSP2pro, and RSP1A were evolutionary products. Recently SDRplay introduced a revolutionary SDR product with the release of the RSPduo. What makes the RSPduo unique is that unlike previous RSPs, the RSPduo use two separate 1kHZ and 2GHz 14 bit tuners each having up to 10MHz of bandwidth. 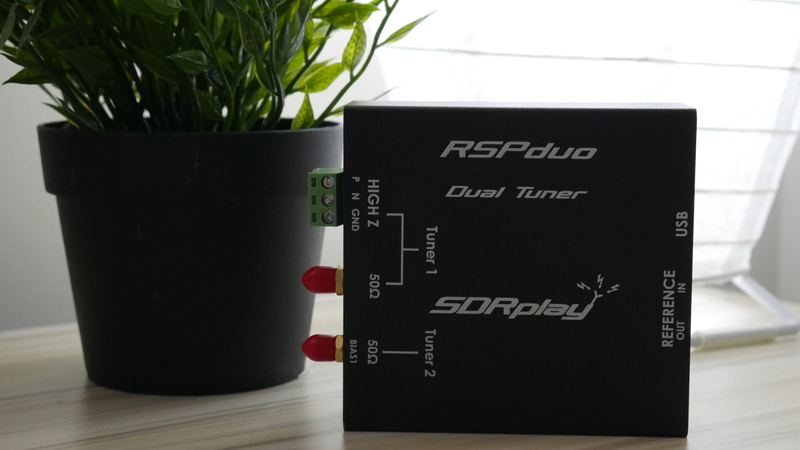 Of course the best part is that SDRPlay managed to bring the RSPduo to market with a list price of only $279 is pretty amazing. Ok. lets put that into perspective. Right now their only two SDR transceivers on the market that feature dual independent receivers. They are the Icom IC 7610 (street $3200), Anan 7000DLE ($2995), Anan 8000DLE ($3595) and the Flex 6600 (starting at $3999). Ok to be fair, these radios are 100 to 200W amateur radio transceivers, but if you want a SDR receiver with dual independent receivers, the SDRPlay RSPduo is a terrific bargain. While all the previous SDRPlay SDR receivers have offered pretty wide sample rates allowing you to split the signal into many virtual receivers, you are confined within the selected sample rate as to the frequency range these virtual receivers can cover. The RSPduo removes this restriction allowing each receiver to operate independently within it’s maximum frequency range of 1kHz to 2GHz. 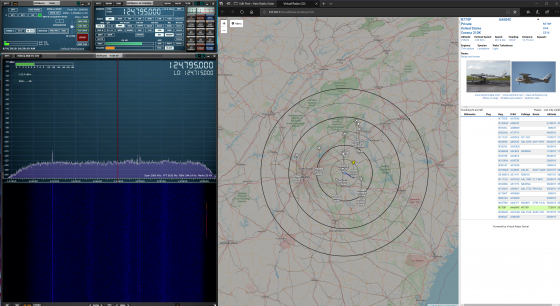 For example you could be listing to the VHF aircraft band in the 108-136 MHz range while receiving ADSB at 1090 MHz. Couldn’t you do the same thing with two SDRPlay RSP1As? Absolutely. However, with the RSPduo you only need to use 1 usb port and both receivers are synchronized greatly reducing latency between to the two receivers unlike. This lack of latency opens the door for a very useful feature for radio hobbyist. diversity reception. In a nutshell diversity reception uses to two receivers with separate antennas to null out interference and increase the readability of the signal you are trying to listen to. Diversity reception can have a pretty dramatic effect on nulling out noise sources and is an incredibly nice feature to have available. This feature is not quite available at this writing via the SDRuno client application, but hopefully sometime soon. Also since the RSPduo is capable of acting as a coherent receiver we may see even more interesting radio applications for it such as “virtual radar” or “stitching” the two receivers together for a whopping 20MHz if bandwidth. The RSPduo comes in a heavy duty metal case unlike some of it predecessors which were housed in a fairly sturdy plastic case. The big advantage here is that the RSPduo is more readily protected from stray RF entering the through the case. Compared to the RSP1A and RSP2, the RSPduo is much heavier. However, the RSP2 Pro can also be had with a metal case for a slight extra expense. There are two SMA 50 ohm antenna connectors on the front panel plus a High Z port. The back panel houses the USB connector along with reference clock in / out connectors. 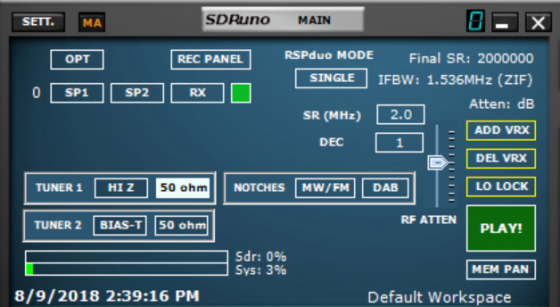 Like the RSPs in the SDRPlay line, the preferred software is SDRPlay’s SDRuno. At this writing there is a special version of SDRuno that supports the RSPduo that can be downloaded from the SDRPlay web site. 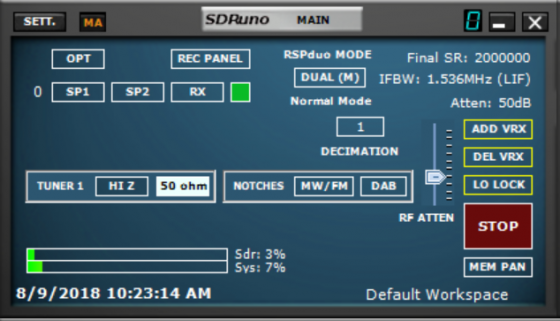 This version of SDRuno has been modified to take advantage of the SDRduo’s dual receiver structure. The software will let you operate the RSPduo in two basic modes. In Single mode the two receivers are basically are synchronized together and show up as one receiver. In this mode each receivers antennas are addressable. You can switch between each receivers antenna ports but you are only able to see a single tuning control and spectrum / waterfall display. Very similar to operating a RSP2 with its two SMA and one High Z port. The sample rate can be set between 2MHz and 10MHz which is referred to as “Zero IF”. The other mode is call Dual with two selections. One selection is “Normal” and the other is “ADSB”. When Normal is selected SDRuno will display the control panel items along with the spectrum / waterfall info for tuner 1. Switching to “Dual Normal” changes the control panel to show only settings for Tuner 1 along with the spectrum / waterfall. In the dual mode the sample rate for both receivers is set to 1.536MHz which is referred to as “Low IF”. To access the second receiver you will have start another instance of SDRuno which will display the controls and spectrum / waterfall for Tuner 2. Dual Mode ADSB will let you run a special version of 1090 Dump for the RSPduo which can be downloaded from the SDRplay website. When starting 1090 Dump, the software will directly address Tuner 2 of the RSPduo and set the Tuner to 1090MHz and begin downloading ADSB data which can be fed to the Virtual Radar Server software for plotting. 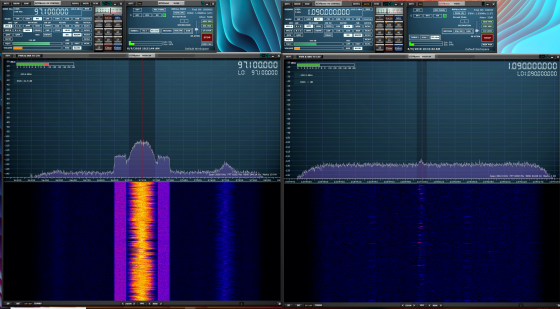 You will not see Tuner 2 available in the SDRplay software in the ADSB mode since it is being used by 1090 Dump. One thing to note is the next time you start SDRuno after it has been set to Dual mode, is that it will still be set in Low IF mode and you won’t see the bandwidth selection area. To correct this, you must go to the Settings menu and manually set the IF to Zero-IF to regain the bandwidth setting control. Outside of the above differences, SDRuno works pretty much the same as it does with all RSP products. Very recently SDRPlay released a new API for the SDRduo that will allow interfacing with 3rd party software. Hopefully some new interesting applications should show up in the near future for the dual tuner RSPduo. Receive performance of the SDRduo seems to be on par with previous RSP products. However it does perform slightly better than the RSP previous products in sensitivity. After a good bit of listening between the new Flex 6400M and the SDRduo, it was often difficult to tell the difference between the two. Most of the listening tests where conducted using a W4OP loop antenna and both receivers performed quite well. In some instances the RSPduo performed a little bit better than the 6400M. However this is more of an Apples to Oranges comparison since the 6400M is a 100 Watt transceiver with a much larger feature set. However the little RSPduo could hang in there with Flex Beast which is pretty could considering the $269 cost of the SDRduo to the $4000 Flex. Not to mention the additional coverage of the VHF/UHF/Satellite bands which also seem to be a bit hotter on the RSPduo. ADSB reception on the SDRuno is outstanding. Even with a small whip attached directly to the back of the RSPduo sitting inside the studio, it still managed to pull in signals from over a 100 Miles away. With the ability to monitor air band with the second receiver, the RSPduo is an excellent SDR for aircraft enthusiasts. Probably because of the heavy duty case, there was very little interference from the computers and other gear that was running along side of it in the studio space. Well except one computer which has a very noisy CPU. However, none of the SDRs in the studio can stand up against this one since the interference is received through the antenna. All in all, the SDRduo is a very solid little SDR receiver that performs very well. It appears the SDRPlay has hit another homerun with the RSPduo. Again blowing away the competition in providing an SDR with dual independent SDR receivers with great performance for $269 is an amazing feat. When diversity reception becomes available, the RSPduo will probably be the “go to” SDR for the serious radio hobbyist. If you are considering trading to a new SDRPlay RSP or just looking to get into SDR radio, get the RSPduo. The dual receivers should allow for more advanced features in the future. Now if SDRplay would just tack a 5 Watt transmitter onto the RSPduo and price it at around $500, that would really upset the SDR apple cart. A simple 20 dB attenuator will make the sdr ‘s hufterproof regarding strong signals. You can go to 30 dB. Why ? look at the curves regarding man made noise and others. A noise factor from 30 dB doesn’t matter on the lower part of the spectrum. And that in combination of a well designed dipole or long wire.